Irish Life & Permanent has confirmed that it provided what it terms ‘exceptional support’ to Anglo Irish Bank during September 2008. In a statement the financial institution said it made the deposit following the introduction of the Government Guarantee Scheme. The statement goes on to explain that during a period of ‘unprecedented turmoil’ in global financial markets there was ‘an acceptance that financial institutions would seek to provide each other with appropriate support where possible’. It added that the transactions were fully and appropriately accounted for in the books and records of Irish Life & Permanent and in regular reports and returns to the Financial Regulator. The statement follows and earlier revelation that Government appointed directors in Anglo Irish Bank are investigating a deposit of billions of euro by Irish Life & Permanent in the bank before the end of its financial year. It is understood the issue of how the deposit affected accounts at Anglo Irish is also being investigated by the financial regulator. 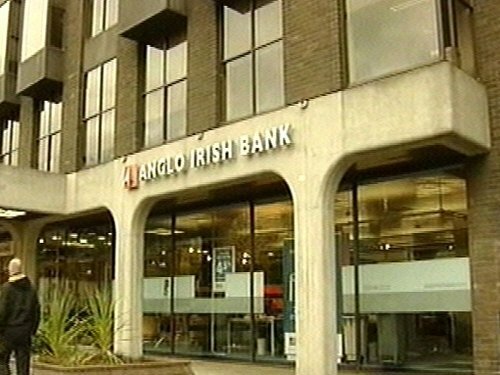 Sources have told RTÉ News that volatility in deposits in Anglo Irish Bank was one of the reasons the Government moved to nationalise it. Fine Gael Enterprise Spokesman Leo Varadkar has said the suggestion Irish Life & Permanent had made the deposit fed the fears of all those who expressed concern about the crisis in our banking sector and the existence of a golden circle at the top of Irish society. Labour’s Finance Spokeswoman Joan Burton said the claims bolstered the case for the appointment of a High Court inspector to investigate the goings on at Anglo Irish Bank. Separately, the Dublin Docklands Development Authority has been accused of having an unhealthy relationship with Anglo Irish Bank in the purchase of the Irish Glass Bottle site. A Dáil Committee heard today that two directors of the Authority were also Anglo Irish directors when the bank agreed to part finance the purchase of the 20-acre Ringsend site for over €400m. Docklands Authority Chief Executive Paul Maloney told the Dáil's Environment Committee today that the Authority does not regret purchasing the site in the consortium also involving two developers. Mr Maloney said even though the value of the land has dropped by about a third it will still be needed for future regeneration of the docklands. He said that nearly €290m was borrowed from Anglo Irish Bank and AIB but the Authority is only liable for €26m. He said no interest has been paid on this loan since last June but afterwards he refused to say why citing commercial reasons. Mr Maloney said the loan is being renegotiated but no revaluation of the site has carried out. Fine Gael Environment Spokesman Phil Hogan described this as a 'casual approach'. He also produced documents showing that then Docklands Authority Chairman Lar Bradshaw and Head of Finance Sean Fitzpatrick who were both directors of Anglo Irish Bank attended a board meeting in October 2006, which heard that developer Bernard McNamara would be asking Anglo Irish Bank for a loan. Mr Maloney said both directors were absent from another meeting the following month where the actual financing of the Anglo Irish loan was discussed. He said that potential conflicts of interest had been declared but Mr Hogan said he was calling on the Minister for Finance to investigate the 'unhealthy relationship' between the Authority and the bank.